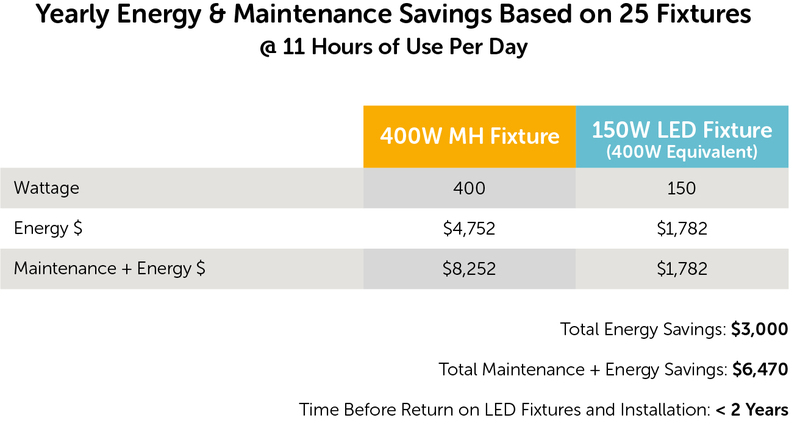 As if energy, maintenance, and disposal savings weren’t enough, switching to LED fixtures and bulbs can be even more beneficial with state rebate programs. 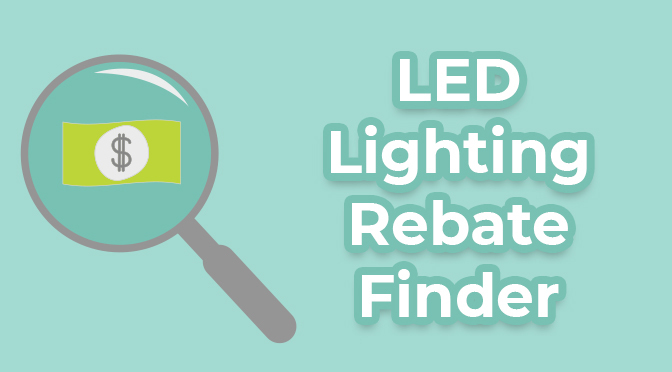 Our new LED Lighting Rebate Finder allows you to see potential energy rebates that are available when you replace less efficient fixtures and bulbs with certain LED lights. The rebate finder is easy to use and includes thousands of utility rebate programs across the U.S. and Canada. 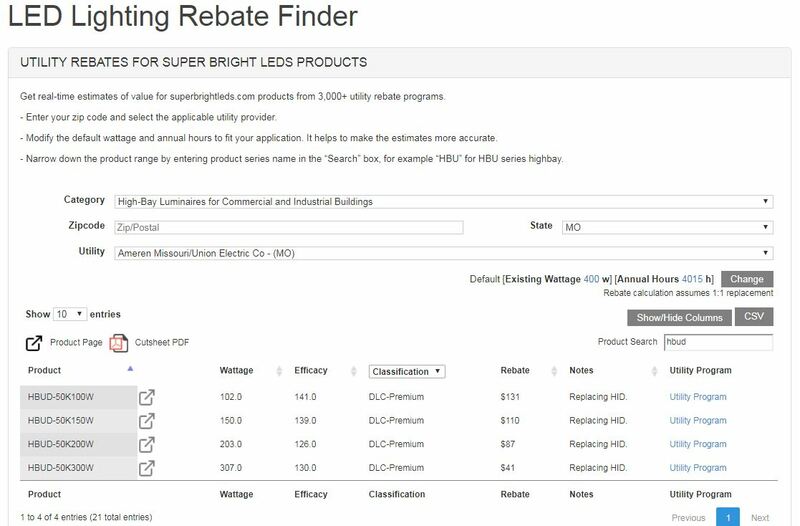 With the LED Lighting Rebate Finder, you can search for qualified LED products by category or by using the search bar for an exact product match. Categories include high-/low-bay lights, architectural and flood lights, panel lights, area lights, replacement bulbs, and more. After selecting the desired product category, make sure to enter either your zip code or state and select your local utility company from the dropdown list. Products that we currently carry will have an arrow icon that brings you directly to the product’s more information page with photos, pricing, and a detailed list of specifications. For quick product information, the energy rebate finder shows a table with customizable specifications, such as wattage, lumens, efficacy, and DesignLights Consortium (DLC) classification. This table is also where you’ll find estimated rebate amounts and links to individual utility program pages. Use these links to find specific information about starting the rebate process. At the top of the table, you’ll see options to set the existing wattage of the fixture you’re replacing and the number of hours it’s currently being used; this allows for a more accurate rebate estimate. You’ll also find the “show/hide columns” button for selecting which specifications you want to see. There’s also an option to download a CSV file that includes all of the information on the table. Rebates can help offset the cost of new LED bulbs or fixtures. With this energy rebate tool, you can get a clear picture of just how much you’ll be spending on your new LED products plus how much you’ll be saving over time. Simply use the information in the Finder to compare against your current lighting specifications. Here’s a quick example to show you how much you could be saving by switching to LED lights. The product used in this example is our 150W UFO LED High-Bay Light. We’re comparing it to a 400-watt metal-halide fixture with the same output. All figures, except LED fixture cost (without rebate), are based on estimates/averages or use averages in formulas to arrive at the given numbers. Actual figures may vary based on local electricity, product, and relamping costs as well as disposal fees and environmental or usage factors. The average price of electricity per kilowatt-hour (kWh) is 12 cents. To figure out the monthly cost of running the 25 LED high-bay lights for 11 hours per day, this formula was used: (combined wattage x monthly hours of use)/1,000 x price per kWh. For 25 LED lights, (3,750 x 330)/1,000 x .12) the total would be $148.50 per month or $1,782 per year. You could potentially recoup your initial investment in less than one year but definitely before two years. Your first year with LED lights would be $3,530.75 + installation costs. If not for the energy rebate of $110 per fixture, first year’s price for the fixtures plus energy costs would have been $6,280.75. 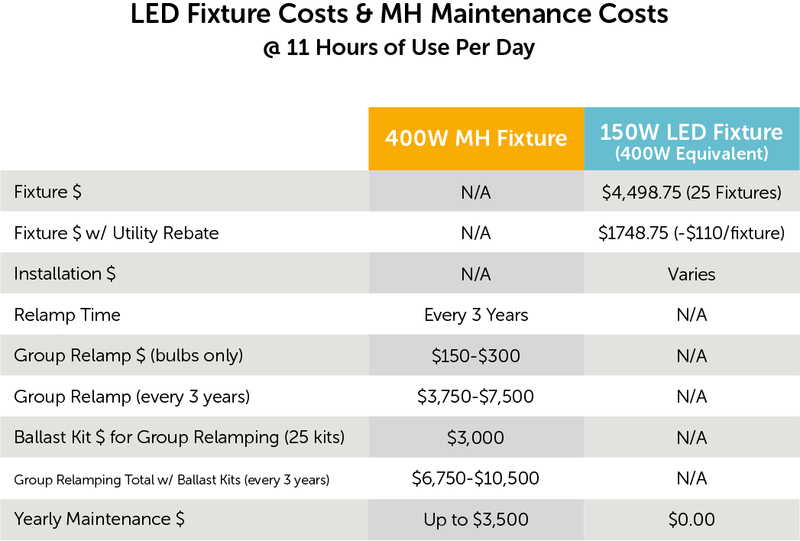 Unless installation costs are very high, chances are in your favor that you’ll still be spending less in the first year than you would have with the MH fixtures. In the second year, new costs would be just $1,782 compared to the $8,252 that it used to be before the switch, which means you’ll be saving $6,470 a year! In this case, the energy rebate saved $2,750! The rebate was for $110 per fixture and was based on Ameren Missouri’s BizSavers® program.